I was already signed up for the Run and Ride Cedar Point Half Marathon when Run and Ride released their medals for the 2016 race season. Once I saw the medals I knew I had to collect them all! Why you may ask? Because each race length had a different Peanuts character in a roller coaster cart and they connected with magnets to form an entire roller coaster train!!! 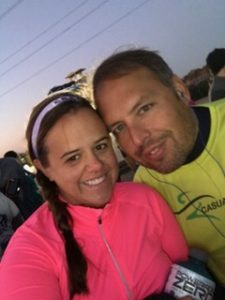 So I chose to run the Cedar Point 5K in addition to the Cedar Point Half Marathon, and then do the 10K and 1 miler at Kings Island. However, there was one problem: I realized after signing up for the Cedar Point 5K that there was no 1 miler at Kings Island :(. Unfortunately, my roller coaster SMO collection is incomplete, but that just entices me to run more Run and Ride Races next year! 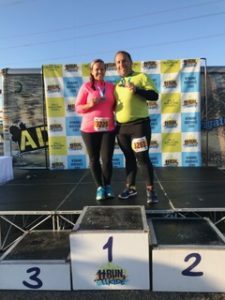 I also had another reason for choosing the 10K this weekend: I had to take a little over a month off of running and knew I had a half marathon two weeks from this race I knew it would be a perfect benchmark race to add to my training plan. I have not even had a chance to tell mention the free park admission that comes with the race bib…can anyone say Golden Runner Award? We had plans the day before and I live relatively close to Kings Island so we decided to drive to Kings Island the morning before the race. We arrived at the race a little before 7am for a 7:40 am start. The race day staff was great and we had no problem picking up our bibs at the starting area (Mike will have more to say about this in a future article). We received a grey, short sleeve tech shirt for the race that had the same design as the Cedar Point weekend shirts, but advertised Kings Island on the back of the shirt instead of Cedar Point. The best part of our race swag was a one day park ticket to Kings Island that we had to use during the race weekend, we decided to go into the park after our race since we were just coming up for the day and did not want to miss out on the roller coaster riding opportunity. This was going to be my first race since the summer and I definitely had to adjust to the temperatures. I chose to wore a dry fit long sleeve quarter zip shirt, purple Under Armour tank, black sport leggings, Swiftwick running socks, VSX sports bra, and Brooks Adrenaline GTS 16 (which are officially retired after this race). As the race started several hours before park open, there was a single entrance to the parking lot, which we learned quickly because we went to a closed entrance. Once parked, we had a short walk to the starting line. We decided to hang out in the car until the last possible minute in order to stay warm, however, we soon learned we were going to have a large problem with our race morning. We decided to go back to the car to keep warm (temps were in the 40s, brrr) and my car would not start. After Googling what could be wrong with my car I concluded that I had a dead battery and there was nothing I could do about it this early in the morning. The race must go on! Accept. Adjust. Advance. We headed out of the car to the start line once the half marathon took off (their start time was ten minutes before the 10K). We had just enough time to get our running belts on, watches started, and headphones on, and then we were off! There was no noticeable change to this course from the 2015 Kings Island Half Marathon. 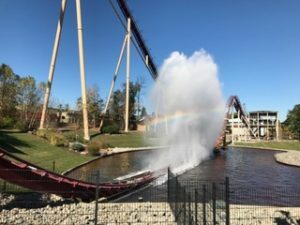 However, since Mike is going to give you the rundown on the course in his coming article, I will give you my opinion of the course, especially since I only had to run the course one time around and I knew what to expect this time. The first mile and a half of the course is spent circumnavigating the Kings Island parking lot that actually has a few bunny hills throughout the parking lot which makes for a wonderful run/walk for me. I was not in the mood to follow my watch for set times for my runs and walks, so I just went with what I felt was right. I have always been a firm believer in walk up hill and run down hill, so this worked great for this course as you will see once I get to the last few miles. One more note before I move on to the next part of the course; during the parking lot run we got two water stops in the parking lot, which was great! I will say this race does an amazing job with water stops because they are able to use 3 of their 4 water stops twice, which creates 7 water stops for a 10K (which is unheard of, so kudos!). It’s finally time to head into the park via the main entrance where you run up past the line of water fountains and make a right to head toward Planet Snoopy where you are greeted once again by wonderful volunteers giving out water and Powerade. As you run thru Planet Snoopy you will pass the mile two marker and make your way toward Diamondback and The Beast (two great roller coasters). Next you will loop back toward the Eiffel Tower passing by the Stunt Coaster. As you go around the Eiffel Tower you get to enjoy the water station again then head toward Coney Mall. I noticed some really awesome Halloween Decorations on this course and some of the Haunted Houses they had set up. I really was enjoying myself running throughout the park and it made me excited to get back to the park after the race! It was now time to head to King’s Island’s Action Zone, which includes the Banshee, which I was definitely excited to ride! 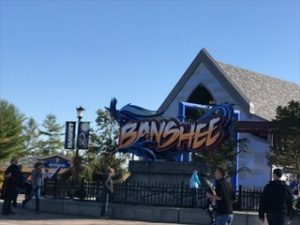 (Editor’s Note: Candace may have insisted that Banshee be the first roller coaster to be ridden using the park tickets we got with our race bibs). After running through this area it was time to leave the park and go around the back of the park, which on the way the mile three marker was passed. The back half of this course is a challenge. I joked in my race preview for the 2016 Wine and Dine course about Disney’s “Heart Attack Hill,” well, these hills on the back half of the course are no joke. I found myself thinking okay someone really could have a heart attack on one of these hills! Now all of that being said there were some decent hills before mile four of the course, but nothing that I felt was too challenging. I actually had my best mile (time wise) during this area, which I attribute to the amazing downhills. The mile four marker was right before getting ready to run through Dinosaurs Alive! At this part of the course we came upon another water station (yay) and some very loud cheerleaders (nay, sorry I don’t like people yelling at me to run faster, but they were definitely enthusiastic). After coming out of Dinosaur Alive! Once again I was able to enjoy the water station and mile five was just around the corner. The next mile of the course is the toughest mile. There are a few steep uphills on this mile one being so steep I found myself stopping to catch my breath. 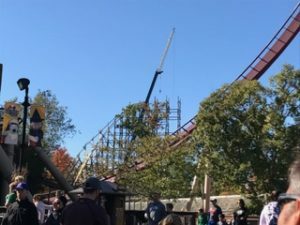 I will say one enjoyable part of this course was seeing the construction of King’s Island’s new roller coaster “Mystic Timbers.” Soon after the hills to my right I saw the train tracks and knew that I just had to follow these for a little bit and I would soon be in Soak City, which also meant NO MORE HILLS! The last bit of the course is spent running around Soak City. It is kind of strange to see a water park closed up for the season, especially a drained lazy river. This area during the fall also serves as a kids fall festival area set up with the Peanuts Gang and the Great Pumpkin. As I rounded my way to this area of the course Mike had come back after finishing the race to run the last little bit of the race with me. Before exiting Soak City we passed the mile six marker and the end was within sight. Unfortunately there is a little more parking lot navigating to be done including running past the finish line and turning around to run back toward it. As you can tell from the beginning of this article I was definitely excited about the SMO. The SMO for the 10K had Charlie Brown’s sister, Sally, on it. 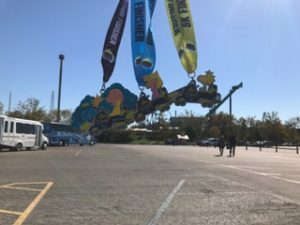 I couldn’t wait to get back to the car to take pictures of it with the other two medals I received from the Cedar Point Run and Ride races, which featured Charlie Brown and Woodstock! The finish line area included printed results for each runner so you were able to know your finish time almost immediately. They also had a nice selection of beverages and some bagels and bananas. Mike would be mad if I did not mention this one, nay, shout this one from the hilltops. They had chocolate milk! Attention race directors, if you want to buy the love of every Casual Runner, follow Run and Ride’s lead and have chocolate milk at the finish line! It really is the perfect post-race drink. Ok, Mike, are you happy? Hope so. We took this all in for a few minutes, but begrudgingly had to make our way back to the car to deal with dead battery. (Good news, we got the battery jumped (thanks to Kings Island Security), drove to O’Reilly’s, got a new battery, had breakfast at McDonalds, and made it into the park for early entry to race participants at 10:30am). Did I not mention that our race bibs also got us in 30 minutes before the general park opening? Yup, we were on the front row of Banshee before the gates even opened. I cannot say enough nice things about the people at Run and Ride. They put on a great race, with great SMOs, and amazing Swag! This is definitely a challenging 10K course and even more challenging if you do the half since it is a double loop course. That being said, I would absolutely run this race again.